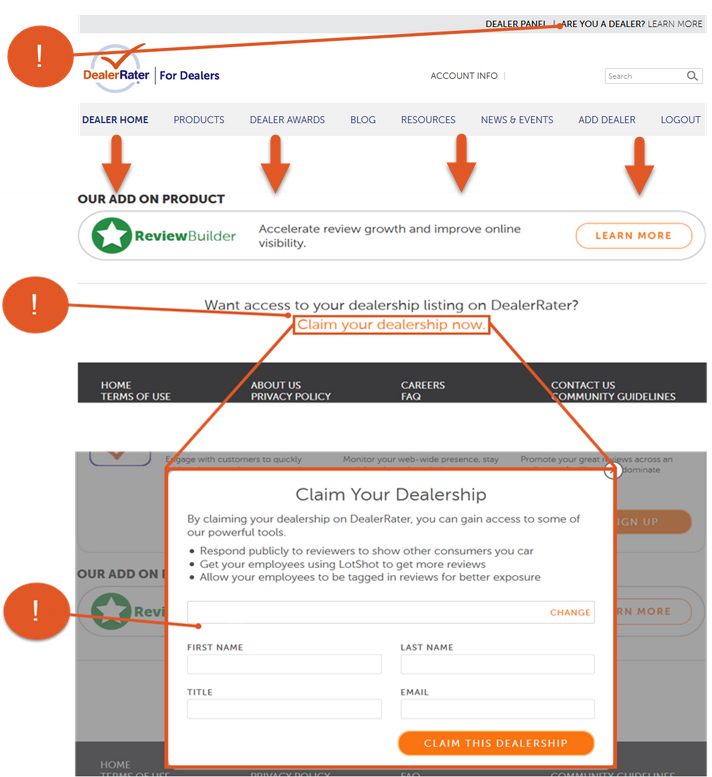 Want to claim your dealership's DealerRater profile? We recommend you consider signing up for DealerRater Connections, our core product which will help your dealership engage with potential customers, monitor your presence across the web, and promote your reviews, employees, and reputation across major search engines and automotive sites. If you're not quite ready for DealerRater Connections, you also have the option of signing up for Basic Listing access. A Basic Listing account is a free account which allows you to claim your dealership listing on DealerRater and even utilize some of the basic features available through DealerRater Connections for DealerRater Certified dealers. You can click here to read more about a Basic Listing account. From the DealerRater home page, click "Are You a Dealer" in the upper-right corner of the page. Scroll to the bottom of the page, and click "Claim Your Dealership Now"
Enter your contact information (first and last name, job title, and email address) in the spaces provided. Please note that we ask for you to claim your listing with an account registered to your dealership email address. If you do not have access to an email address under your dealership's domain, we will need for you to provide us with a contact at the dealership who can authorize your access. Click "Claim This Dealership" to submit your request. Your request will be routed to our Client Services Team, and you should receive notification that your request has been processed within 2 business days. For more information about the tools and features available through Basic Listing access, click here.